Golden, sandy beaches and authentic natural beauty. Antiparos and Paros are divided by a narrow channel. The island is notable for its golden, sandy beaches and for its authentic natural beauty. The capital, Antiparos or Kastro, stands around the original nucleus of the medieval castle. Among the principal attractions of Antiparos is the famous cave of stalactites on Agios Ioanis hill. There is a chapel to St John of the Cave (Agios Ioanis Spiliotis) at the mouth of the cavern. Antiparos has a number of beaches with golden sand and blue-green water. All around Antiparos are scores of tiny islands, like guards posted out at sea, inhabited only by wild rabbits and pigeons. 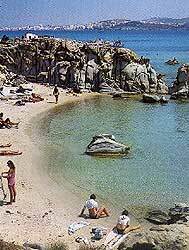 On a small island called Saliagos, which is between Paros and Andiparos, found in 1964 neolithic village dated in the end of the 5th millenium B.C. That time, according to the foundings, the two islands were connected and the first man on Andiparos showed up in the neolithic age. Excavations on the island of Despotiko have revealed the ruins of tombs dating from the Early Cycladic era. 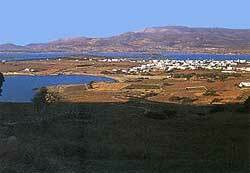 The main village, Andiparos or Kastro,is built around the original nucleus of the mediaeval castle. The island's main attraction is the spectacular Grotto with stalactites on Agios Ioannis hill, with the little church of Agios Ioannis Spiliotis at its entrance. There are several beautiful beaches with golden sands and clear blue-green sea. On the north of the island there are the wonderful beaches of Psaraliki (5' from Andiparos) and Sifneikos Gialos (10'). On the south is Ai Giorgis. On the north of the island there are the wonderful beaches of Psaraliki (5' from Andiparos) and Sifneikos Gialos (10'). On the south is Ai Giorgis. There are a lot of bars, pubs and clubs.